Whether it is a parent in the grip of Alzheimer's or a spouse missing in a disastrous event, we are all touched by ambiguous loss. 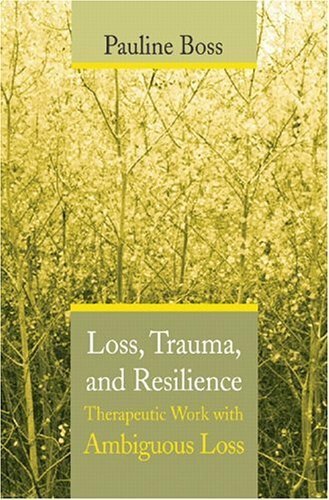 This work guides therapists with concepts and practices in the task of building resilience in clients who face the trauma of loss without resolution. She received her Ph.D. in Child Development and Family Studies from the University of Wisconsin-Madison, where she subsequently taught for many years. In 1981, she joined the Department of Family Social Science at the University of Minnesota, where she is now Professor and Clinical Supervisor in the doctoral training program in marriage and family therapy. She was appointed Visiting Professor of Psychology at Harvard Medical School, 1995-96. Dr. Boss is a past-president of the National Council on Family Relations and is a past-president of the Groves conference on Marriage and the Family. How Does Normalizing Ambivalence Relate to Resilience?